What's a Flight Officer? : Joint-SAREX: How much better can it get? Recently, MDWG and WVWG conducted a joint SAREX with the National Guard. The Wing also posted a personal perspective located here. This is just the latest in a line of joint efforts between MD and WV Wings. The first took place last September with a joint SAREX on Maryland's Eastern Shore. The second was a joint mission, conducted in conjunction with the MD State Police. 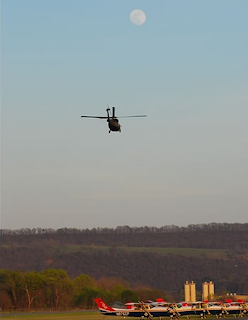 This SAREX was unique as the MD National Guard was able to transport members of the wing on Blackhawk helicopters straight to the mission base in West Virginia. I've said time and time again that Col. Wiess (MDWG Commander) has done an excellent job increasing the readiness of the wing regarding Emergency Services. Additionally, the MD Adjutant General has referred to CAP as "One Heck of a Resource". If there was any example as to the support this wing has received from the National Guard, this is it. Although I was unable to attend, my understanding was this was a great event. I hope more like it can be planned in the future. I have no doubt that more of this will come.